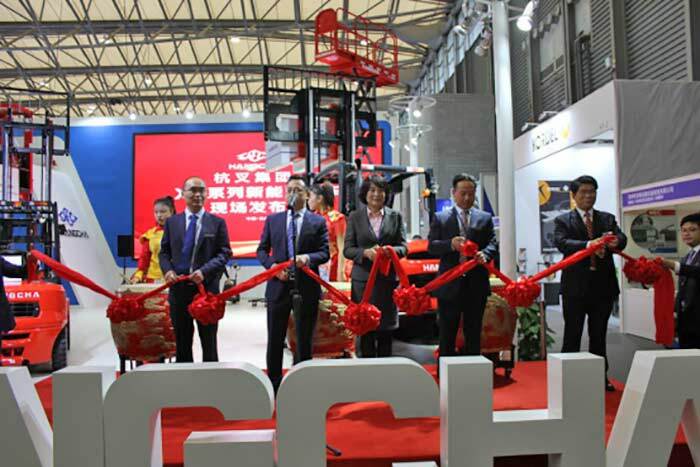 On November 6, 2018, CeMAT Asia 2018 was officially launched at the Shanghai New International Expo Centre (SNIEC). Hangcha Group has showcased its more than ten new products at the exhibition. 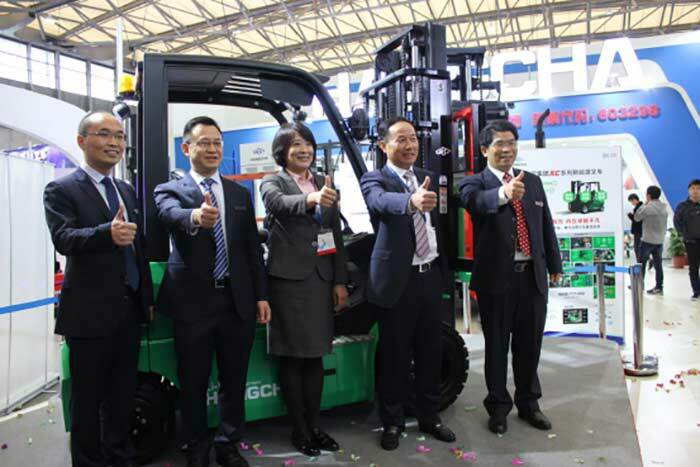 Under the trend that green, environmental protection and intelligence have become the theme of the times, Hangcha Group has released XC series new energy forklift and C series lithium battery at the exhibition, and held a grand product launch conference. At 10:00, witnessed by the media, customer representatives, dealer representatives and many audiences, Zhang Jie, Secretary General of the Chinese Industrial Truck Association and Secretary of the Board, Marketing Director, Chief Engineer, Deputy Chief Engineer of Hangcha Group, presided the ribbon cutting ceremony and unveiled the XC series new energy forklift and C series lithium battery. 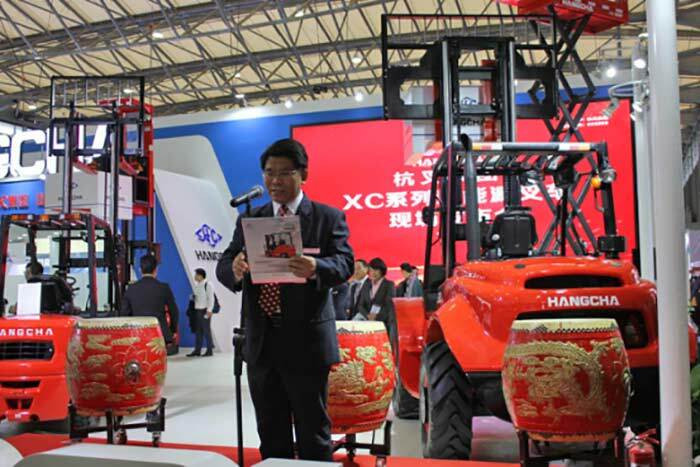 Hangcha XC series new energy forklift not only highlight the advantages of Hangcha Group, but also reflect the efforts of Hangcha Group practicing the social responsibility of low-carbon life-style as a listed company, Zhang Jie said. On behalf of Hangcha Group, Mr. Chen Saimin, Secretary of the Board of Hangcha Group, expressed his gratitude to the leaders and guests who were presented at the conference. He said in his speech: thanks to the supply-side reform, Hangcha Group has made great progress and achieved great development. Adhering to advanced technology, exquisite techniques and efficient service to provide high-quality industrial trucks to customers around the world, it shows the innovative features of Chinese high-end equipment manufacturing enterprises. At the same time, in the process, Hangcha Group has won the favor of our customers. In the afternoon, Hangcha Group held a press conference of XC series new energy forklift and C series lithium battery at the conference center, Xu Xiang, Chief Designer of Hangcha Group, and Hu Jianguo, Technical Director of Contemporary Amperex Technology Co., Ltd. (CATL), introduced the performance of the truck and lithium battery, and interacted with reporters and on-site guests of Chinaforklift.com, Chinachuyun.com, etc. 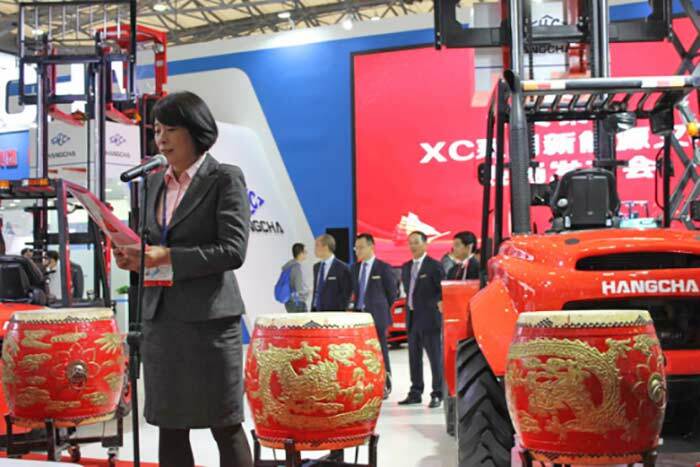 Xu Xiang mentioned that the XC series new energy forklift adopt a new crossover shape and are specially designed to replace internal combustion forklift. The truck adopts a special structure and breaks through the traditional electric forklift design method. It combines the advantages of internal combustion forklift and electric forklift. It is far superior to the traditional lithium-ion battery model modified by traditional lead-acid battery in terms of performance, waterproof level, vision and ergonomics. The Hangcha C series lithium battery equipped by XC series new energy forklift is a lithium battery for forklift jointly developed by Hangcha Group and CATL. The Hangcha C series lithium battery has the characteristics of strong environmental adaptability, long cycle life, maintenance-free and high reliability. It provides long-lasting and powerful power for the XC series new energy forklift, which provides a guarantee for its replacement of internal combustion forklift. At the conference, Hu Jianguo, a senior expert in the industry, Technical Director of CATL, fully demonstrated the advantages of Hangcha C series lithium battery. The combination of XC series new energy forklift and C series lithium battery is a ‘good horse with a good saddle’, which will certainly create greater value for customers. 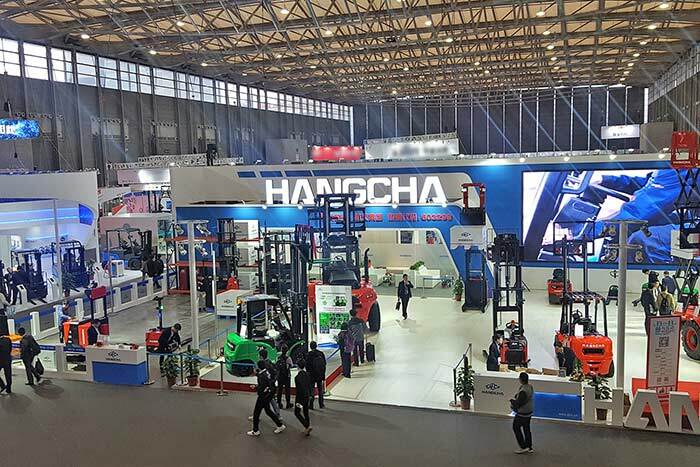 At the same time, We sincerely hope that both sides can carry out further cooperation and help Hangcha Group to realize the grand vision of being the best forklift truck manufacturer in the world.